The task was to produce a design for a contemporary garden with a ‘wow’ factor and then implement the design in this beautiful rear garden space in Washington. The garden had a lower level with a long patio and then steps to an upper level. The client wanted to level his lawn area to the higher level and increase the privacy of his plot with screening. We decided on creating a lovely decking area which would be illuminated by the setting sun on Summer evenings, ideal for entertainment or just quiet family evenings. We wanted a new area of decked steps connecting the two levels and after alot of discussion we developed this as an excellent feature of the design. We used high quality materials including a classy Finnish wood for the deck. A corner pergola was designed to sit around the upper deck and we used bamboo to screen the area, giving the garden an Asian feel in line with our clients love of international travel. We used small trees, including a pretty Prunus to start the process of increasing the garden privacy. Low maintenance is a big issue with many clients very busy with their work. 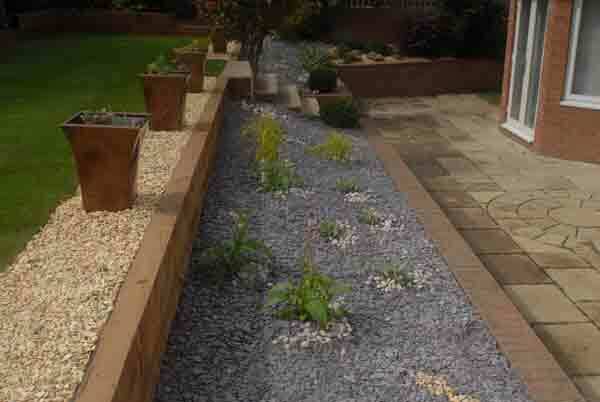 Here we used decorative aggregates on the lower border area, planting blue asters, perisicas and yellow green sages. 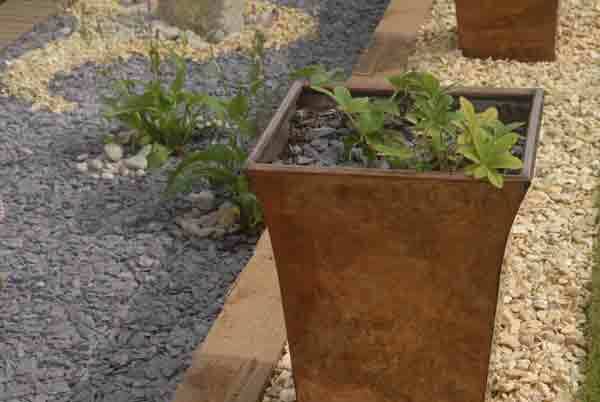 Bronze planters were used and I chose heathers for some and rare potentillas for others sourced from a local specialist collector. 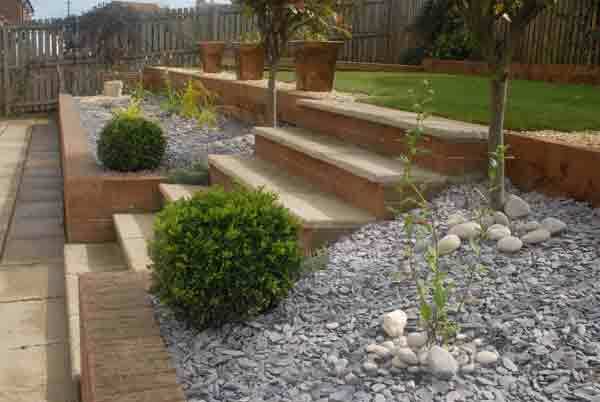 We also designed in a new water feature using a small granite monolith. 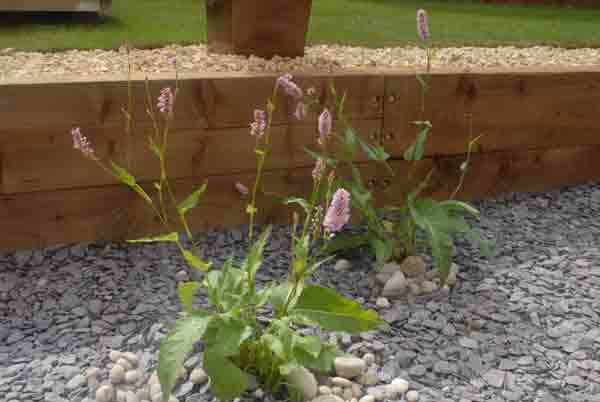 The lawn was levelled and returfed and the soil was supported by railway sleepers, which was trendy and the most cost effective solution. 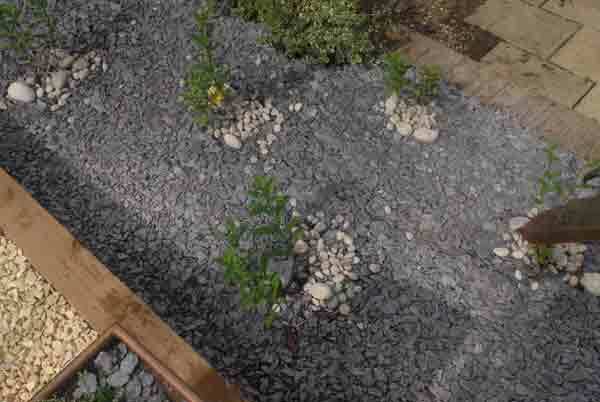 A raised bed of sleepers was also created around the highest border to unify the design and protect the shrub roots. My client and I discussed all ideas at great length by email, phone a several visits and he said that one of the best things about undertaking this project was the way in which he had been able to feel excited and involved at all stages of the design process until we finally came up with this beautiful result.